The Tower Bridge is located in above the River Thames, London. On June 30th, 1894, the Tower bridge was opened by King Edward VII. The design of the Tower Bridge was done by Horace Jones and Wolfe Barry, the bridge was constructed in the year 1894. The Tower Bridge contains two massive towers which are linked together. The bridge stands at a height of 60 meters and the height of each tower is about 43 meters. The middle part of the bridge can be lifted up when huge ships pass through that way. In the past, the bridge was lifted nearly 50 times per day. Initially, the Tower Bridge was constructed as a level crossing over the River Thames, as the population of London grew, new bridges were constructed. 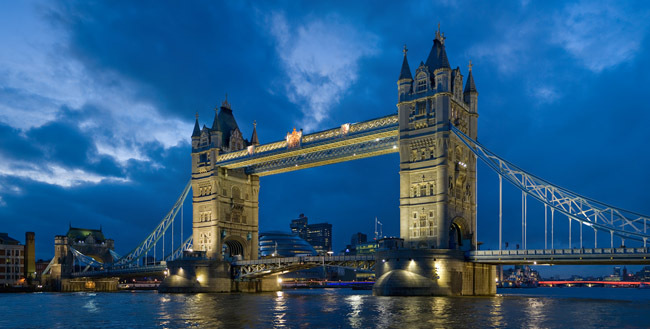 But among all the bridges in London, Tower Bridge is the only one of its kinds. During the construction of the bridge, almost 50 designs were taken into consideration, these 50 designs can be viewed at Tower Bridge Exhibition. Finally, John Wolfe Barry and Horace Jones (architects) designs were chosen. Eight years were involved in the construction of the bridge, about 430 laborers and five contractors took part in the construction. Two enormous pillars were downcast deep into the Thames River and 11,000 tons of steel are used in building the walkways and towers. The towers are then built with Portland stone and granite. The construction of the bridge pictures can be viewed in the Tower Bridge Exhibition. The Tower Bridge is operated by hydraulic methods. Over six massive accumulators are used in the operation of the bridge. These machines use steam to generate power and the power is fed to the accumulators. Using this energy, the bridge bascules are lifted up to a height of about 86 degrees. But from the year 1976, electricity and oil were used in place of steam. In addition, the bridge also uses navigation system for the signaling of ships and to control the traffic. •	In the year 1910, the walkways for the public have been designed. •	In the year 1912, Frank MacLean, a pilot has flied in the center of the bascules. •	In the year 1952, a bus jumped over the other bascule during the rising of the bridge. •	In the year 1977, the bridge was painted in several colors. •	In the year 1982, Tower Bridge Exhibition was opened. •	In the year 1993, the Centenary exhibition was opened at the Tower Bridge. •	In the year 1994, the bridge was available for events and parties. •	In the year 2002, the Tower Bridge Exhibition was reopened. •	In the year 2007, the Tower Bridge Exhibition celebrated its Silver Jubilee. The Tower Bridge exhibition is a special attraction, where the designs, construction and the operating of the bridge can be viewed. The Tower Bridge is a great tourist destination and one of the mostly visited spots in the world. In the present days, the Tower Bridge is closed for some repairs, but it is open on certain days. There are numbers of flight services from all over the world to the London Heathrow Airport. Frequent train services are available from the underground London Bridge stations. In addition a number of private bus services are available frequently. WOOOOOOOOW amazing bridge i want to vist it one day!!! This is one of thee amazing landmarks that I, myself wouldn’t mind going to see someday! i this is so cool and this is my favourite bridge. this is amazing. great view. love the sites!! View of the Tower Bridge most beautiful at dusk. It’s a very beautiful?, I hope to visit one day, with a girl who will love her and marry her. wow real nice and beautyful. would love to go and see it personal one day. Wow Its really an amazing & astonishing. I salute those heroes who participated in its construction. All the laboures, architechts & all involved personals r truly admirable.